Chirognomy is a form of hand reading that studies the appearance, size and shape of the hand and fingers to determine the character, nature and personality of an individual. 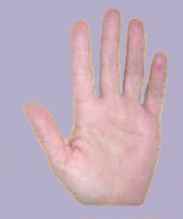 From this hand analysis a palmist can with some degree of accuracy predict the likely outcomes and future destiny of the individual. The elements of Air, Earth, Fire and Water categorise the different hand shapes. Look at your own hand to identify which element type you have. 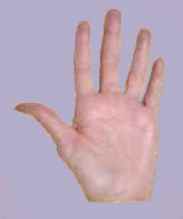 The length and shape of the palm in relation to the length of the fingers determines the elemental type. Is your palm oblong or square, are your fingers long or short? Fire Hands A Fire Hand is characterised as an oblong palm and short fingers. People with Fire Hands tend to be enthusiastic, energetic and passionate. They tend to get excited easily and have a child like lust for new things, people and experiences. They have lots of creative energy and when they are fired up and motivated there is no stopping them. People with Fire Hands have boundless energy and need to be active at all times. They seldom take time to relax and always seem to living life at a 100 mph. They like to be first and best in everything and make excellent leaders. On the downside people with Fire Hands can be self centred, bossy and domineering. Water Hands A Water Hand can be identified as one that has an oblong palm and long fingers. People with Water Hands tend to be very sensitive, sensuous and intuitive. They are real 'people persons'. They are great listeners, care givers, counsellors and nurturers. They are also very imaginative and creative. Water Hand people tend to have some form of artistic streak to their nature and use their art to demonstrate their feelings. Many poets, artists and sculptors have Water Hands. People with Water Hands are often psychic and can tap into the emotions and feelings of others easily. Earth Hands A square palm and short fingers identifies the Earth Hand. Earth Hand people are as you might expect down to earth, practical and hard working. People with Earth Hands tend to be very reliable and trustworthy. They have little time for airy fairy intellectual pursuits and prefer to roll up their sleeves and get the job done rather than analysing how to do it. Physically Earth Hand people tend to be strong and like to use their energy in physical pursuits. They generally are the outdoors types, enjoy physical exercise and love nature. They are also cautious, conservative and moderate and do not take risks or indulge in unhealthy habits and life styles. Because of this they are very robust, healthy and strong. 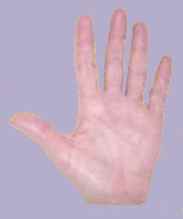 Air Hands Air Hands can be identified by a square palm and long fingers. People with Air Hands tend to be intelligent, articulate and use logic and reason to explain the world. They rarely use their intuition and prefer instead to employ facts, figures and scientific knowledge to explain things. Air Hand people definitely allow their head to rule their hearts. People with Air Hands tend to be full of bright innovative ideas and concepts and have many interests. They love to learn and thrive on knowledge. They are also excellent communicators and make good teachers, politicians and lawyers. Air Hand people tend to be great worriers and suffer stress and anxiety more than most. They also bottle their feelings up and try not to display publically their true feelings and emotions. In the study of palmistry the fingers are assigned the names of the planets and as such share their attributes. The Index Finger is known as the Jupiter finger and indicates traits such as leadership, determination, self esteem and confidence. In hand analysis people with a long index finger demonstrate strong, determined and confident characters. They are natural leaders and command respect and admiration. They are very sure of themselves and have high self esteem. People with very short index fingers in relation to the other fingers tend to have the reverse character traits – low self esteem, low confidence and the inability to direct, lead and assert. 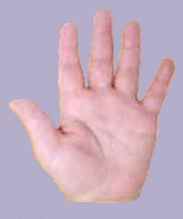 In palmistry the Middle Finger is ruled by the planet Saturn and indicates wisdom, spirituality and mental strength. The longer the middle finger the more likely a person is to be mentally healthy, capable, serious and spiritually strong. A short middle finger in relation to the other fingers can show a tendency to sadness, melancholy and depression. A bent middle finger indicates a secretive and mysterious character. The Ring Finger in palm reading is ruled by Apollo. This finger indicates creativity, artistic flair and the love of beauty. The longer the ring finger the more creative, artistic and appreciative of beauty an individual is. A bent ring finger indicates exceptional artistic gifts. In the art of palmistry the Little Finger is ruled by the planet of Mercury and indicates intelligence, excellent communication skills, sharpness, cleverness and sociability. Basically the longer and straighter the little finger is the more likely a person is to be popular, clever and successful. The Thumb is ruled by the planet Venus and indicates willpower, dominance and drive. The larger the thumb the more likely the person is to be successful, dominant and assertive.